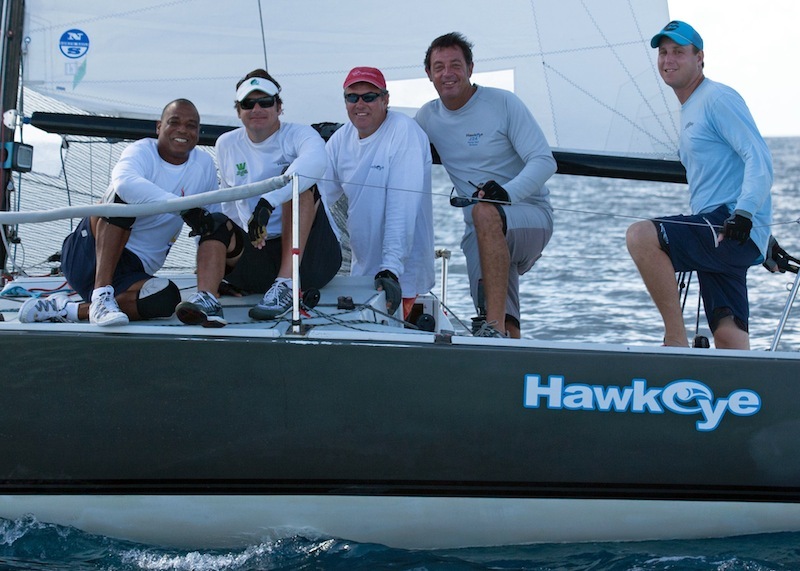 The concluding races of the Mount Gay Round Barbados Race Coastal Series took place Monday. Although the conditions were unusually light and fluky, the racing was intense in all classes with most fighting it out for overall honors right to the bitter end. The only exception was the J/24 class, which saw Robert Povey and his local hotshot team on Hawkeye walk away with the winning title with a race to spare. Interestingly, Team Hawkeye, who went into the final day’s racing with an impressive 1,1,1,2,2,2 scoreline, had a disastrous day. They were slow off the start at the pin-end in the first race, and found themselves stuck on the wrong side of the beat. They ended that race in eighth place, while Neil Burke and team on Republic Bank Impulse pulled through early leaders Robbie Yearwood and team on Die Hard to finish first. Die Hard was second. The start of the second J/24 race of the day, in extremely light airs, produced the first individual recalls of the series, one of which was Hawkeye. She retired while the rest of the fleet struggled round the course. The race to decide second overall became intense, but it was the team on College Funds who managed to sail well in the light airs to score their second win of the series. Chatting about his overall win and the change of tempo in Monday’s racing, Povey commented, “We are absolutely delighted, particularly at not having to sail the last race, which turned out to be long and windless. In the first race, we had a poor start and decided to head right where we thought the pressure would come in. Everyone who went left was on a headed course and was also in down pressure. We thought we had made a great decision, but those on the inside got a huge left shift. It was a gamble and we lost, and there were no real passing lanes from there on. We also softened the rig in that race but we couldn’t point so well, which didn’t help matters.” Full results are available at https://app.regattaguru.com/bcc/100086/results.